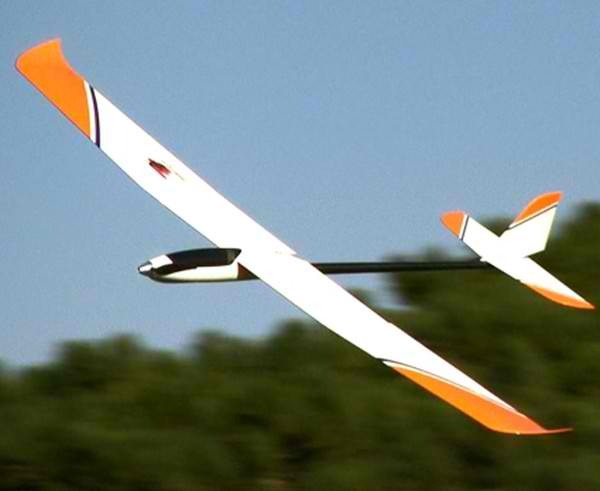 i love this combination, a sailplane that is also a glider and a hotliner at the same time. With the right setup, you can sail the sky with or without wind, you can rip the sky like a hotliner or simply glide at will. This is a 69″ wingspan glider with some serious flying characteristics. The specs suggests to use a 3S lipo on a 1800kv outrunner motor, but i would use the MicroDAN 2505-2900 Kv outrunner on a 4S 1000mAh lipo and a 45Amp ESC, keeping the plane super light and at the same time powerful. a 5×5 prop will do or for more thrust, you can use an APC 6 x 4, 20200 RPM, 9.98V, 30A, 25oz Thrust. Wing area: 462 sq in.